Promotional products, when used in conjunction with a sales letter or as incentive to respond, can make a significant difference in direct mail response rates. The use of promotional products can also significantly improve a business’ effectiveness in converting leads to sales appointments. 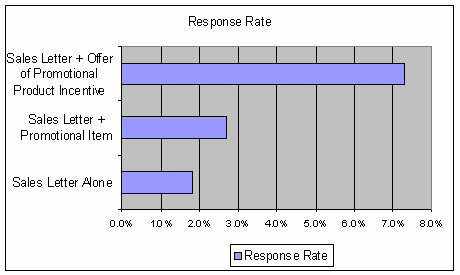 The following are findings from a 1992 direct mail study by Silver Marketing Group. • Adding a promotional product to a mail promotion increased the response rate by 50%. • The use of a promotional product as an incentive to respond generated four times as many responses as a sales letter alone. • The use of a promotional product as an incentive to respond reduced the cost per response by two-thirds. • The study was conducted in 1992 with 1,482 businesses divided into three groups. Each group received either a personalized sales letter, a sales letter plus a promotional product or a sales letter with the offer of a promotional product incentive. Note: While Trigger Direct did not participate in this campaign, we believe this information to valuable and factual.